Amsterdam. In Amsterdam the Dutchman became Raymond. Mister Leather Europe 2017. He received the Shag of the previous Mr. Leather Europe 2016 after a brilliant euro show and with congratulations from the public. Other participants during the elections were the Leathermans of Finland, Belgium, Poland, France, Italy, Austria. 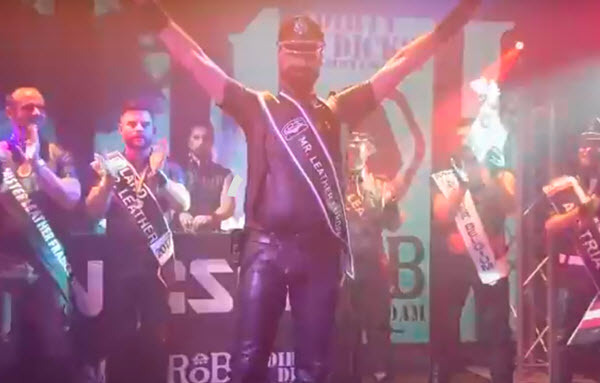 The Raymond coming from Amsterdam (Netherlands) had the day before his title of Mister Leather Amsterdam 2016 issued a new title carrier and has now received the title of Mister Leather Europe 2017. He will now be wearing Mister Leather's title for 2 years (with one day interuption between tittles). The fact that Raymond won the tittle in his own home town is not a coincidence. His presentation and imaginative flagshow with European theme did taste the audience. Raymond really came across among the other candidates like the Mister Leather Europe.